Mark Ciociola and his wife used Discovery Maps when they went on vacation and liked the product so much as users that they decided to open up a franchise. And then another. And then two more. We recently sat down with Mark Ciociola, owner of four Discovery Map franchises: Gatlinburg, TN; Pigeon Forge, TN; Big Island, HI; and Park City, UT. We learned how they overcame some of the challenges they faced when opening up their franchises, where they see their businesses headed in the next five years and what advice they have for potential franchisees. We purchased our first one in March 2009 and another one a year later. We started Big Island, HI in 2013 and Park City, UT in 2015. 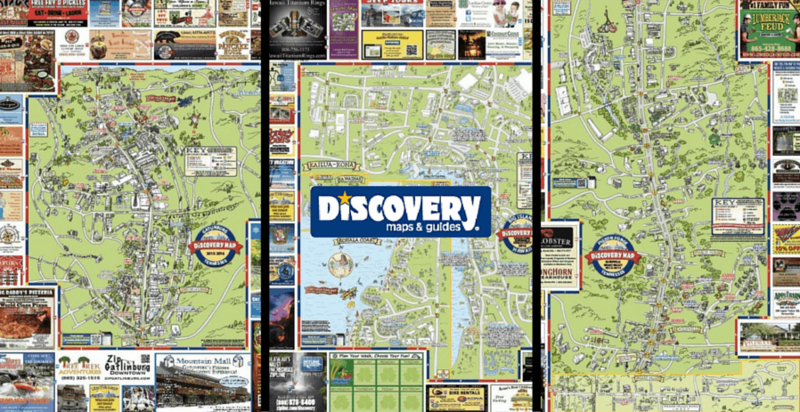 What were you doing before becoming a Discovery Map franchise owner? We were selling real estate. In 2008 the market crashed where we were working and we quickly realized we were going to have to find something else to do to support our family, especially with our first child on the way. We had always used the maps when we went on vacation and really liked the product as users. We had always felt it was a great thing for a community to have. We considered starting a new franchise in the location we were living; however, we weren’t sure we wanted to do that since several of the local businesses were struggling at the time. Our timing was impeccable, however, because right as we were talking about that I noticed the existing and established Gatlinburg, TN location for sale on the Discovery Map website. It was about an hour away from where we were living so we decided to jump on that ,and I commuted the hour. It depends on the time of the year. The busiest time of year for each franchise is the eight weeks or so each year when we do sales. I typically do office work for about an hour each morning and then hit the streets from about 10 a.m. to 5 p.m., Monday to Friday. I will go door to door to local businesses and talk to them about the map. In addition to a business, it has been a great way to get to know the local business owners, and we have met some friends as well. Since we purchased an existing map I was expecting to retain a large number of the businesses on map the pervious year. However, what I failed to take into account was we purchased in 2009 when several of those businesses were struggling. We lost several of the existing clients we had purchased. However, it ended up working out in the long run because we found several new businesses who saw the need to advertise more in a down economy. Several of those new businesses are still with us six years later. I spoke with a couple of fellow franchisees prior to buying our first territory. We also looked back at the renewal rate throughout the years of the businesses on the map we were buying. We had used the product before so knew we were buying a good product from a franchisor that had been around (at the time) for almost 30 years. Be nice to people. The majority of our customers are small business owners like us. We take the approach that we are not selling them something but are offering them an avenue to help their business grow. We have had a great time getting to know many of our customers and have shared advice with each other that benefited both of our businesses. We really like the fact that we are just one of many small businesses in our community. Our goal is to consolidate to multiple territories within a fairly easy commute of each other. The nature of this business is that once you have a territory up and running it is feasible to spend just 2-3 months a year in that area. While it is definitely possible having four territories in three different parts of the country, it gets to be a lot of travel. Having everything within a day’s drive of each other is definitely a priority for us. Every year that we start a new sales cycle in one of our locations we see a number of businesses close and new ones pop up. It’s always sad for me to see, someone with a dream and a vision that did not make it. It also makes me very humble and grateful that we found this business. I ask myself why that is and what separates us from the bakery, t-shirt shop, restaurant, you name it, that didn’t make it. I think it is two-fold. First, we have a proven product that people love and use. Second, we have a low overhead. Very little equipment to buy and no storefront required. Absolutely! It is a great business model that allows us to make a good income doing something that is fun. It allows great flexibility in scheduling our time and has very little overhead, especially compared to many other small businesses. One thing we did not anticipate when buying our first territory back in 2009 was the rapid changing nature of the technology side of the industry. However, we are fortunate that the franchisor did. They have been out in front of this ever-changing digital industry. They continue to roll out new features, products and aspects of the business that continue to make us at the forefront of the industry. Had this not been the case we may not have chosen to expand as far and as quickly as we have.